Not your traditional example of the pieced donkey pattern published as 'GIDDAP'.. Perfect to gift to someone with political leanings. 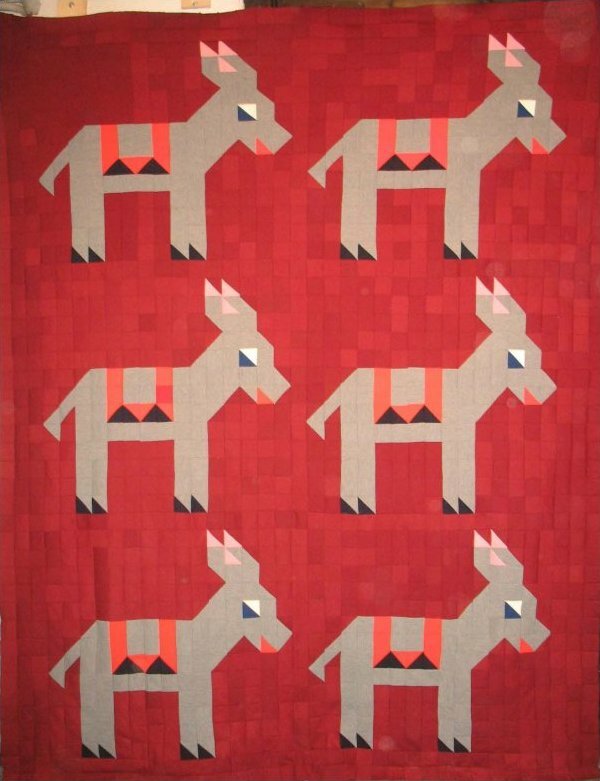 A published pattern called 'GIDDAP', also 'Democratic Donkey' There was a companion/opposition block to the donkey of an elephant called ‎'Ararat' (Brackman #226.76). Published in the Kansas City Star, both first issued in 1931. This one is unusual in that it is made of grey wool jersey rather than the traditional printed cottons of the era. It is a charming, almost realistic interpretation as done in the grey color, and even seem to have facial expressions. There are actually 10 donkeys in the top (6 shown here). Completely pieced in squares measuring about 1 1/2". Ready to complete as a quilt or to convert to your imaginative display use.